If you are, for example, a small store in Hong Kong that sells beach hats, and you are describing your product by using keywords such as “fashionable”, “design”, “beach” and “hats”, you will have to compete with big worldwide companies and brands that sell “beach hats” as well. If you add the keyword “Hong Kong” you will be narrowing it a little, but you’ll still be missing a big chunk of the market. WE WILL EXPLAIN … but before let’s begin by learning what are “long tail keywords” and why they’re so important for your business. 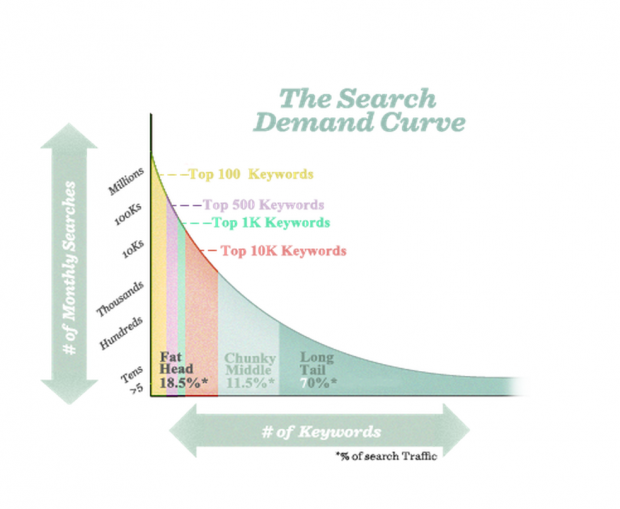 Long tail keywords are very specific search terms made by users who want specific information. People who use long tail keywords tend to convert better since they are at a later stage in the conversion cycle. On our “hats store” example… Someone who searches for “hats” is probably aiming to browse a range of hat styles until they find something they like the look of. In the other hand, someone searching for “fashionable large straw hat with ribbon in Hong Kong” is looking for a very specific style of hat that they no doubt already know they would like to buy. You as a hat retailer, need to optimise your website and blog articles to target specific keywords. By doing that you will be targeting lower levels of traffic compared to the broad “hats” keyword, but you will see a higher conversion rate since you will be fulfilling the specific needs of highly engaged buyers. When creating your keywords strategy, it can be tempting to target broad terms which see hundreds or even thousands of daily searches; that could be hundreds of people to your site every day, right? It’s not as easy as that though. Keywords with high search levels make up around 30% of all daily searches, whilst long tail keywords with low search levels make up 70% of all daily searches. If you only optimise for high profile terms, you end up ignoring 70% of daily searches – a huge figure! Search engine optimisation for long tail keywords is therefore crucial for a successful keywords strategy. Diversify keywords – gather a large list of specific keywords that are closely related to your company and products, and incorporate them into your SEO strategy. Create lots of content – target niche areas for long tail keywords; make sure content is unique and highly relevant in order to ensure high engagement. Share content everywhere – don’t just stick to Twitter and Facebook; share content on a wide range of social media platforms to reach as many people as possible in order to drive traffic to your niche topic. Because in the SEO science, guessing is never a good option. We have selected a couple of tools that will help you do just that: find the right long tail keywords! Google AdWords allows you to gather relevant keywords based on your existing content or the nature of your business. To find long tail keywords, insert a broad search term and look for keyword ideas with low monthly searches that could be relevant to your business. The other 30% are broad keywords that can drive a lot of people to your website if your SEO strategy is robust. If you are, for example, an italian restaurant in Hong Kong, you will still want to be targeting those general keywords as this is also an important way to be found online. For many small businesses, utilising search engine optimisation for inbound marketing is very important but incredibly time consuming, particularly for those who are new to SEO.By working with an SEO agency, you can make sure you will be implementing an effective long tail keywords strategy, that will drive engaged users to your site and increase conversions. WANT PEACE OF MIND? Contact Karma today! Did you like this article, or would like to add something? LEAVE US A COMMENT.